Whoever is wise, let him heed these things and consider the great love of the LORD. Sometimes God takes drastic measures to get our attention. Other times he just uses the ordinary daily things. This time, in my case he used a pickle to remind me that He loves me, is merciful and prefers I learn to yield to Him. Always. It was close to ten in the evening. I remembered that there was supposed to be a “Super-moon”. Actually my dear hub reminded me. Of course, I wanted to run right down to the beach. Even though it was a bit cloudy. We are so close. I plead my case to the hub, who wants to head to bed…the “grumbling” in my heart begins. I ask my girl, who on second thought, decides she wants to squeeze in five more minutes of screen time over heading to the beach at ten PM with Mom. Mom, starts to complain within. Soon enough, without. But first I grab the last pickle in the dish on the counter from dinner. As I come down the hall to give them both a piece of my mind, I find myself choking. Really, choking in the way that everyone (except my preoccupied daughter engaged in her tiny screen world) would normally consider a potential Heimlich moment. 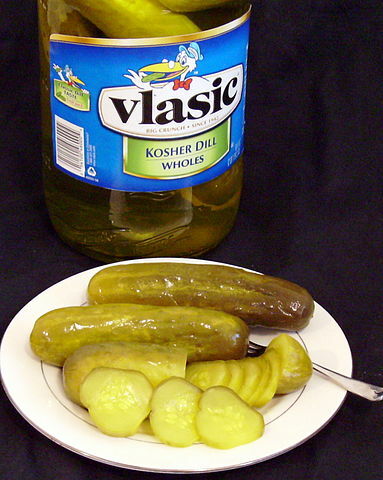 Have you ever been pickled before? Fortunately, God chose not to completely take me out as I really would prefer not to enter into His presence and exit this life through the means of a pickle. But, one never knows. Truly I was dealt with mercifully. And I lived to tell the tale. 1. Halos are for children in Christmas pageants and really, you don’t have one. Even when you think you do. 2. A “Super -Moon” is cool but a Mom who is super gracious is way better. 3. If you see a lonely pickle lying on a plate, walk away. Originally written as “Pickled” for submission to Guest Post for 5 Minutes for Faith. This is one of the most viewed titles on my own blog! True story. Love those kind! Even if I almost choked to death. Anything for a good story. Oh I hate those “zip the lip” lessons! Ouch! On a diff note, I was choking badly on some food, no it was a mouthful of wine! I could not open my mouth and spew so it became a terrible choking situation and actually scared me. All the while Hubs was on the other side of the room and NEVER even turned around to check on me! I had to leave the room because the hard coughing/choking had cause a leak in a diff area. Boy did I let him have it when I came back! LOL! sorry Dawn, but I laughed… you bless my heart!